Your OKI 320/1 should be plugged in to a USB or LPT port on the back of the computer. Don’t worry about Windows drivers, you don’t need to install any. Windows should automatically detect and install any drivers by itself, plus Dealer Solutions talks directly to the printer without need for a driver. Physically, there are 2 items that need to be set on the printer. First, the left part of the adjustable feeding tray should be pushed as far right as it can go, and the right side should be set as close to the paper as possible without touching it. Secondly, the lever on the right side of the printer that specifies rear feed, top feed, bottom feed, should be set in the middle position for Top Feed. Hold down the “SHIFT” Button (2nd from the left) and press the “SEL / MENU” button (1st on the left). This should light up MENU on the panel. Now, looking at the dark grey text below the buttons, click the “GROUP (LF)” button until the left-most column reads “Top Feed”. Now, inside Dealer Solutions, from the Home Screen, click “Tools” on the menu across the top, then “Settings…”, the last item. In the settings window, click “Printers / Program Behavior” on the left. 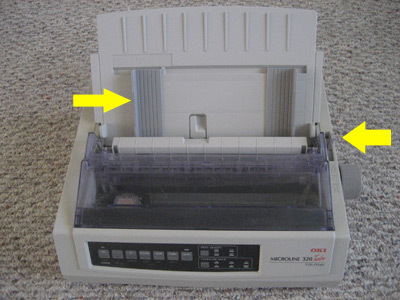 Now, next to “Dot Matrix Printer Device”, drop down the list of printers and select your OkiData printer. Click OK to save your changes. You are now set up to print Multiple Part forms!